Will U.S. join Ukraine peace negotiations? U.S. Secretary of State John Kerry has personally discussed the Ukrainian crisis with Russian Foreign Minister Sergei Lavrov and President Vladimir Putin during his first visit to Russia in the last two years. Despite the absence of an unequivocal statement from the White House, Russian observers are already saying that the U.S. is to join the ongoing negotiations between Russia, Ukraine, Germany and France over the settlement of the Ukraine conflict. U.S. Secretary of State John Kerry has visited Russia for the first time in two years, holding hour-long talks in Sochi on May 12 with Russian Foreign Minister Sergei Lavrov and President Vladimir Putin. The Kremlin is saying that there is still a lack of breakthrough in relations between Moscow and Washington, but Russian observers are convinced that the results of the meeting in Sochi on May 12 will seriously change the mechanism for regulating the ceasefire between Ukrainian government forces and Russian-backed rebels in the Donbass region of eastern Ukraine by including the U.S.in negotiations. Peace talks had previously been conducted in a four-party format made up of Russia, Ukraine, Germany and France. Speaking about the Sochi talks, presidential aide Yury Ushakov said that they were not a breakthrough, but were open and friendly. 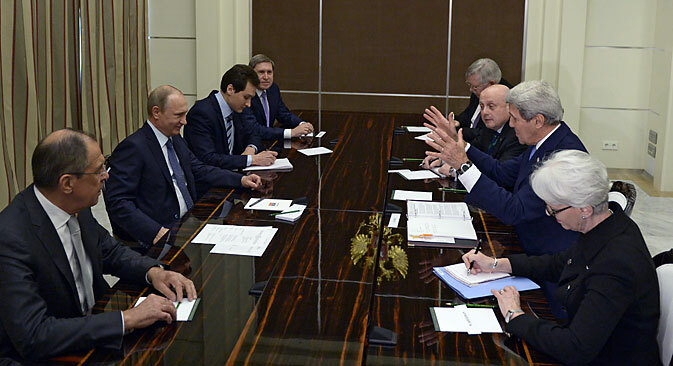 Sergei Lavrov described his meeting with John Kerry as "splendid." Kerry also mentioned the openness of the talks with the Russian president and foreign minister, and, speaking about Ukraine, said that the Minsk agreements "are the best and main way towards peace." "They must be implemented in their entirety as soon as possible," said Kerry. During the briefing on the results of the talks, Kerry, commenting on Ukrainian President Petro Poroshenko’s announcement about Kiev retaking Donetsk airport, which is currently under rebel control, said that he would suggest that the Ukrainian leader think before resorting to military action. According to Kerry, the Minsk agreements would then be "seriously threatened." Kerry's announcements in Sochi are particularly symbolic, said Andrei Suzdaltsev, deputy dean of the World Economy Faculty at the Higher School of Economics in Moscow. Suzdaltsev remarked that Kerry had essentially promised to put pressure on Kiev and admitted for the first time that both sides are violating the Minsk agreements, not only the rebels or Russia, as Washington had earlier announced. Has basic agreement been reached? According to Russian observers, in Sochi the sides were able to reach a basic agreement on the situation in Ukraine. The U.S. will now exercise additional influence on Kiev to implement the Minsk agreements, while Moscow in turn will use its leverage on the self-proclaimed “republics” in the Donbass. The Minsk agreements served as an area of common ground for the American and Russian sides, something that is very important for Moscow, which is one of the guarantors of their implementation, said Dmitry Danilov, director of the European Security Department at the Russian Academy of Sciences. If earlier the U.S. limited itself to political and diplomatic recognition of the importance of the Minsk agreements, Washington will now play an active part in the negotiations over the settlement of the Ukrainian crisis, said Danilov. In turn, this will increase the chances for peace in the region, considering the unusually close ties between Kiev and the White House. Furthermore, despite the lack of a clear statement on the issue by Kerry, Russian commentators are of the opinion that the U.S. has essentially joined the ongoing negotiations on the settlement of the conflictin eastern Ukraine. “The U.S. has practically also entered the system of talks," said Igor Bunin, general director of the Center for Political Technologies, a Russian think tank. "We [Moscow] demanded this, but were not convinced that they would agree to it… [U.S. President Barack] Obama decided to make a careful and thought-out move in our direction." After the talks in Sochi, Kerry discussed the realization of the Minsk agreements on the phone with President Poroshenko and during a personal meeting with Ukrainian Foreign Minister Pavel Klimkin during the NATO summit in the Turkish city of Antalya. Mass media sources report that even though previously Kerry had often said that "it is Russia and the separatists" that must follow the Minsk Agreements, now he remarked that "the critical time to act has come." According to Dmitry Danilov, the positive nature of the Sochi meeting holds promise for the continuation of Russian-American dialogue in the future.